MANILA – President Rodrigo Duterte on Friday welcomed Indonesian President Joko Widodo in Malacanang, with the two leaders agreeing to bolster cooperation on various fronts. 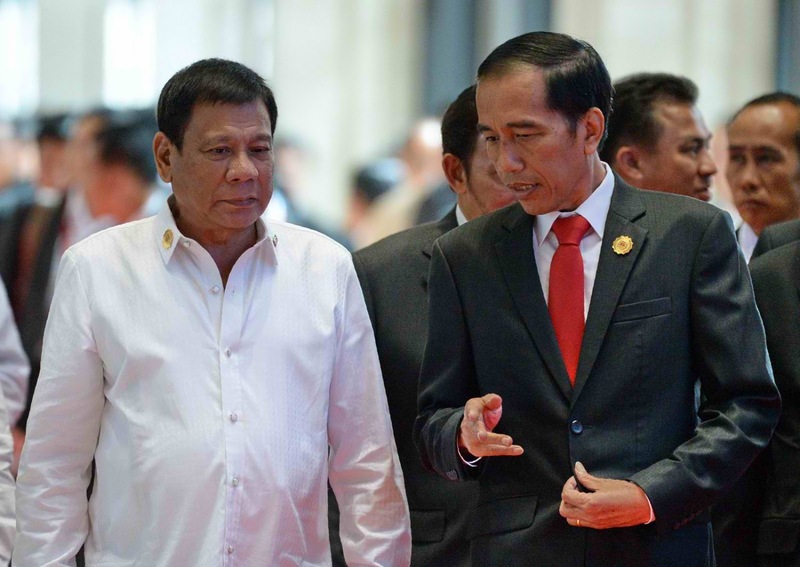 Widodo, who like Duterte was a local government leader who rose to national power, said he and the Filipino leader have agreed to elevate cooperation on politics and security, economy, maritime affairs, and people-to-people contact. “Philippines is a good friend of Indonesia and one of our important partners,” Widodo said in a joint statement after his bilateral meeting with Duterte. The Indonesian leader also highlighted the growing economic partnership between his country and the Philippines, citing the 32 percent rise in bilateral trade in 2016. Duterte, who visited Indonesia last September, thanked Indonesia’s help in developing Mindanao, where he hails from. “I thanked President Widodo for Indonesia’s sustained support for the peace process in southern Philippines. With Indonesia’s assistance and that of our friends, we are hopeful of turning the potentials of Mindanao into reality,” Duterte said. Widodo’s visit to the Philippines yielded two memoranda of understanding, one on enhancing agriculture and another on improving sea linkage. As part of efforts to spur growth in Mindanao and improve trade between Indonesia and the Philippines, Duterte and Widodo will grace the formal launch of the Davao-General Santos-Bitung roll-on/roll-off (RORO) sea linkage route, the first of its kind in the area, on Sunday, April 30. “This will facilitate trade and movement of goods. This deserves full support from both our governments,” Duterte said. The two countries share maritime borders, and in recent years, the terrorist group Abu Sayyaf’s piracy activities have threatened ships passing by these waters. In light of such threats, Duterte and Widodo agreed to ramp up security cooperation. “We recognized the need to address both traditional and emerging threats and expressed readiness to step up cooperation against terrorism, violent extremism, piracy at sea and transnational crimes, including the trade of illicit drugs,” Duterte said. Widodo, meanwhile, said the two countries have agreed to conduct a joint working group on counter-terrorism this year, which will expand the 2014 memorandum of understanding on counter-terrorism cooperation and strengthen intelligence information cooperation. The two leaders met on Friday on the backdrop of repeated calls for Indonesia to spare the life of OFW on death row Mary Jane Veloso, who was sentenced to death in 2010 after being caught with 2.6 kilos of heroin at the Yogyakarta airport. Prior to meeting Widodo, Duterte told reporters he may bring up Veloso’s case with the Indonesian leader, saying he has a “stake” in it. As of posting, however, there was no update yet from the president whether he had indeed brought up the matter with Widodo during their restricted meeting.